At the close of the Middle Ages many houses in the village, the homes of ordinary villagers, would have been poor affairs, huts which could be built or demolished in a day. But not all, for those who could afford it built in timber with an infilling of wattle and daub. Bell Farm has already been mentioned and there were certainly others, though none has survived. It is difficult to be sure which modern houses now stand on their sites. However, the Tudor-Stuart period from about 1550 to 1640 was a time of prosperity for a considerable portion of the population. In the country this meant the landowners, the farmers and the more successful cottagers. 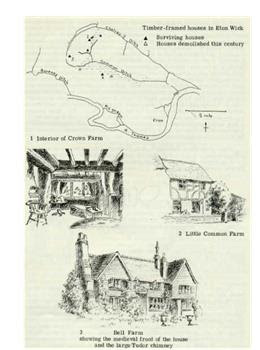 They left their mark on the countryside in the very pleasing shape of many new or enlarged homes. Eton Wick shared in this building boom. Exactly how many houses were built or improved is not known, but at least eight cottages were built in the years immediately prior to 1605 when this was reported to the Crown Commissioners. Unfortunately it has not proved possible to identify these cottages, but ten timber-framed houses survived into this century and five are still standing today. Bell Farm was almost certainly enlarged by the Bell family, who lived there in the sixteenth and seventeenth centuries. They were undoubtedly responsible for the addition of the great chimney stack on the west, and for the parlour on the north side with its own stack. The fireplace of the parlour, with its lovely Tudor arch, was rediscovered in the 1950's. No longer was it necessary for the smoke to swirl around the rafters before finding its way out through a hole in the roof. The old hall could be ceiled over, giving another upstairs room, and a new staircase was built. One can still see many of the old beams and roof trusses in the bedrooms, and an original medieval window with two delightful trefoil lights has survived, though it must have been blocked ever since the parlour was built. The Bell family was a large and prosperous one, farmers and gentlemen as their wills and other records testify. Their names are frequently found in deeds and parish records for over a hundred years until the second half of the seventeenth century when all mention of them ceases in connection with Eton Wick except in the past tense. At the height of their importance locally they owned property in Eton town and were the owners and not the tenants of Bell Farm. A Joan Bell leased 'a fishery in the chapel waters at Boveney in 1578 and a Richard Bell was still in possession of this some thirty years later. 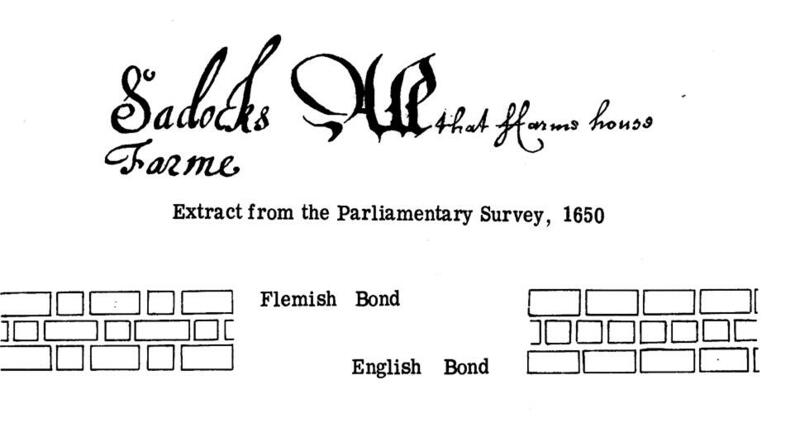 In 1605 Henry Bell was tenant of Saddocks Farm and his brother Matthew of Mustians. About 1600 Henry Bell bought the manor house at Chalvey which he still owned in 1612 though not when he died. In 1641 there was a Thomas Bell at Chalvey and about the same time different members of the Bell family were farming Bell, Saddocks and Mustians Farms. The farmhouse of the last stood on the south side of Common Lane, but its land stretched into Eton Wick. Of the five timber buildings only Little Common Farmhouse still shows its timber frame. It must have been built in the seventeenth century when, so it was thought, there was a shortage of timber because of the increased use of charcoal (for iron-smelting) and for shipbuilding. This meant that the house wrights not only left wider spaces between the vertical posts but also made greater use of odd shaped pieces of wood and re-used old timbers. In Little Common Farmhouse the curved timbers on the front and back of the house have clearly been used before for each has a series of narrow groves along its length. Until the house was enlarged this century it had probably remained little altered , with its two rooms up and down and one large chimney. It was probably never the home of a farmer until recent times, but that of a husbandman or smallholder who rented his few acres in the common fields. On the other side of the Little Common is the house known as Long Close. It is now encased in bricks, its timber frame and its beaten earth floor was not covered until after the First World War. Even then in the living room red tiles were laid directly on to the earth until this was altered in the 1970's. Beams can now only be seen in the ceilings, but many more were exposed during those alterations; the thin red bricks of a chimney breast suggested that it was built or enlarged during the Tudor period. On the south side of the Great Common stands Crown Farmhouse, probably the oldest house in the village still used as a farmhouse. Despite the name its connections with the Crown Estates was quite short, merely from 1864 to 1932. Its timber frame is visible only on the inside, but the thick studs and beams, low ceilings and absence of jettying all indicate it was built in the early seventeenth century. Since then, as the fortunes of its owners and tenants prospered it was altered or enlarged and encased in a shell of plaster and warm red bricks. Some of these alterations undoubtedly took place when it was occupied by one of the Tarrant family. A Robert Tarrant first became tenant about 1800 and one or more of the family have lived there for most of the years since. They have lived in Eton Wick for over two hundred years, the earliest discovered reference to them occurring in the parish registers for the year 1763. Today scores of old farming and household objects, maps and photographs adorn the walls or are put away in cupboards, linking the present family with its predecessors. The fifth of the timber-framed houses is Saddocks Farm. A great deal is known about this farm and house. The name is first associated with Eton Wick in a deed of 1539 when a Robert Sadocke , yeoman, of New Windsor occupied a messuage (house, outbuildings, garden, etc) and lands in the Wick. At this date the property seems to have been owned by Eton College, but in the reigns of Queen Mary and Queen Elizabeth, Robert was leasing the farm from the Crown. In the archives of Eton College there is a draft of a grant from the College to King Henry VIII of property including several acres of land, four messuages and a cottage. One of these was the Christopher Inn in Eton, two were in Windsor, another in the tenure of John Butler in *le Weke' and the fourth was occupied by Robert Saddock. The grant is dated 1546. In 1584 a deed was drawn up concerning a messuage and garden in le Wyk' described as a 'parcel of Eton (Royal) Manor, lately bought of Eton College and annexed to the Honour of Windsor'. None of these properties has positively been identified as Saddocks, but it is certain that the College was selling to the Crown and it seems likely that the land and house soon to be known as Saddocks Farm was included. It was undeniably Crown property from the seventeenth century on wards until it was sold in about 1940. As Crown property it was subject to a number of surveys, but in spite of, or maybe because of these, the house presents a tantalising mystery. Three surveys of the late eighteenth and nineteenth centuries suggest that the whole layout of the farmyard and garden was changed about the turn of the century and the house rebuilt in a new position; yet within the present farmhouse, so clearly built in Georgian times, is a much smaller cottage. It consists of two rooms up and down with a downstairs room height of only 6 ft 4 in. The mystery deepens when attention is paid to the earlier survey of the estates of the late King Charles I under the direction of Oliver Cromwell. At this date the Royal Manor consisted of three tenanted farms, Saddocks, Mustians and the Christopher though it is not clear whether the innkeeper was also the farmer. There were three houses and a cottage belonging to Saddocks and the detailed description of them suggests that they had been built at different periods. The first two, with their timber and earthen walls, and each with a hall, kitchen and buttery and three chambers above, may well have already been at least two hundred years old in 1650. The third house appears to be larger and newer, for its walls were of timber and brick and there were six rooms downstairs, including a parlour, very much a status symbol for the small farmer. But, most intriguing, the small cottage was described as 'built with timber and flemish walls'; if this meant flemish bond, the construction of this cottage was very much 'avant garde' for this method of laying bricks did not come into general use until the second half of the seventeenth century. Where were these buildings? It is frustrating that none can be identified with certainty. It is possible that the cottage is Little Common Farmhouse for it is thought that this was once part of the Crown Estate, or Saddocks Farmhouse itself. Of the five houses that have been demolished this century much less is known and no photographs or plans of them have been found. Three of them formed one building and may originally have been one substantial cottage that was subdivided to form three tiny cottages, each with only one room upstairs and one room down. When this might have happened has not been discovered, but various deeds and maps suggest it had occurred before the end of the eighteenth century. To the east of Crown Farm once stood a pair of cottages, though only one survived into the twentieth century. According to the Royal Commissioners on Historical Monuments this was built early in the seventeenth century. Whether it was ever a farmhouse before Mr. Bunce owned it in the 1920's seems doubtful; in the late eighteenth and nineteenth centuries it was part of Crown Farm and was sometimes occupied by a farm worker. Even less has been discovered about the last of the known timber-framed houses. It stood just west of the Greyhound Inn on a plot of land which stretched from the common to Eton Wick Road. It once belonged to Bell Farm, but in the nineteenth century it was sold and became known as Hardings Cottage, a name it shared with several others owned by the same family. Would there be any way of finding out more about the Tarrants of Eton Wick please? They are my ancestors! Hello Kate, There are six articles about the Tarrant family on Eton Wick History, https://www.etonwickhistory.co.uk/search?q=Tarrant and they are recorded as being resident in the village for all but one of the census records between 1841 an 1911. There is a Mary Tarrant recorded as a beer house keeper in Dorney 1871. If you let us have your email address we can respond to you directly.